Intelligent clothing promises to improve your athletic performance, but practical solutions like fitness trackers and running apps are more useful. I run 15–20 miles a week on New York City sidewalks and through parks without aches or pains, which I attribute to good shoes and good luck. I’m not particularly diligent about stretching or paying attention to my form. Foam rolling? Forget it. But I’d eventually like to start adding longer-distance runs to my routine, and I know I need to be mindful of injuries. So I bought a pair of smart socks—yes, smart socks—to see if intelligent textiles can help me improve my performance beginning at the most basic level: the way my feet hit the pavement. Sensoria, a maker of sensor-filled clothing like heart rate-monitoring sports bras and T-shirts, is back with a pair of socks that can tell you if you’re running wrong. The company’s fitness bundle, which includes two pairs of smart socks, one Bluetooth anklet, and an anklet charger for $199, officially went on sale in May, but the company has been working on the technology built into its smart socks for years. A successful Indiegogo campaign in 2013 helped the company exceed its fundraising goals, and Sensoria took its finished socks to this year’s International CES, where it was honored at the trade show’s Innovation Awards. Press previews of the product were glowing, for the most part. But while intelligent clothing certainly sounds impressive, that doesn’t mean it improves your athletic ability more than, say, run-of-the-mill devices like fitness trackers and smartwatches. So I put these smart socks through their paces to see if high-tech clothing makes a difference. The Bluetooth anklet you snap to your sock is lightweight enough to go unnoticed, though it does make your leg look a little lumpy. Getting the socks ready to hit the pavement requires a little more effort than pairing Bluetooth headphones to your iPhone. You have to charge the anklet (which needs to be charged daily, in my experience), then install the Sensoria app. Use the app to pair the anklet with your iPhone. The socks are helpfully labeled right and left so you know which sock goes on which foot (normally, I have to go it alone on this part). Then affix the anklet to the magnetic strip on either sock and fold extra material over the device to keep it secure. It’s a bit more set-up than I normally prefer before a workout, especially on early morning runs when getting myself out the door is a feat in itself, and I haven’t even grabbed the Apple Watch and Bluetooth headphones I wear, not to mention the Spotify playlist selection that precedes a typical run. After all that work, I open the Sensoria app, start a new workout, and take off running. Each sock has three textile sensors sewn in, two in the ball of the foot and one in the heel. 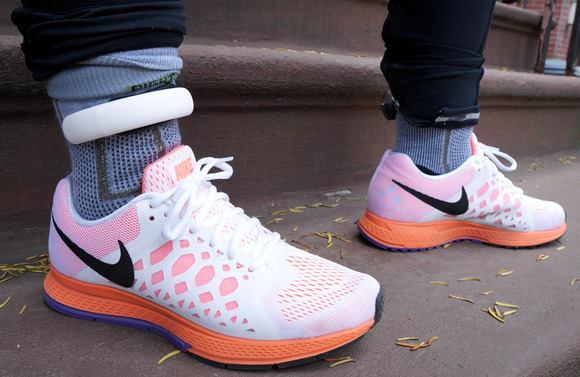 According to Sensoria, the socks are made of conductive fibers and function as “textile circuit boards” that send data from the sensors to the Bluetooth anklet. The anklet has an accelerometer to detect your movement, which it then communicates to the Sensoria iPhone app. The anklet can count steps, measure speed, track mileage, estimate calorie burn, and can pinpoint your foot landing and cadence as you run. The mileage and steps are fairly accurate, but the calorie count is way off compared to my Apple Watch (which taps into its heart rate sensor to calculate calories more accurately). The anklet only transmits data on the foot you're wearing it on, so to see stats on both feet, you'll need two anklets. 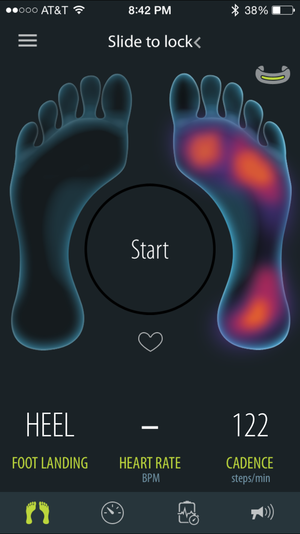 Sensoria's app offers a neat visual of the pressure in your foot as it changes. 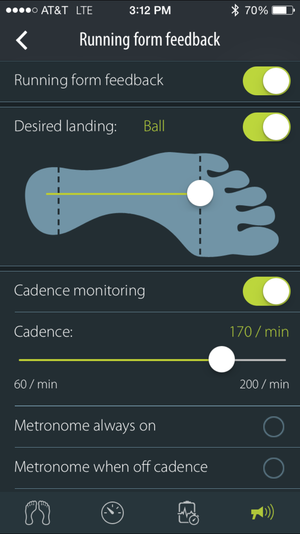 But it’s the cadence and foot landing information that sets Sensoria apart from other fitness-tracking tech. After my first run, the smart socks’ corresponding app showed me some surprising results: I land on my heel 88 percent of the time. Heel striking gets a bad rap because it can lead to knee injuries—and allegedly humans ran on their forefeet back in the good ol’ days before shoes were a thing. I did some research to figure out how and why my form was wrong, and realized that I tend to lengthen my stride to increase speed rather than quicken my steps. If I take shorter, faster strides, I land on my heel less. On my next run, I lowered my heel-striking to 70 percent. Did I need socks to tell me that? Well, no. A running coach can give you the same analysis and offer you more sophisticated tips than a digital coach, which can’t really assess your technique. Or if you enlist a friend to record footage of you running, you’d get a pretty good idea of how often you heel-strike. While there are other ways to analyze your foot landing technique, Sensoria has them beat when it comes to visualizing your performance. While you’re wearing the Bluetooth anklet, the app will show you a heat map of your foot as it moves. You’ll see the pressure in your foot as it changes in real-time, and you’ll also see stats on cadence and foot landing throughout your run. 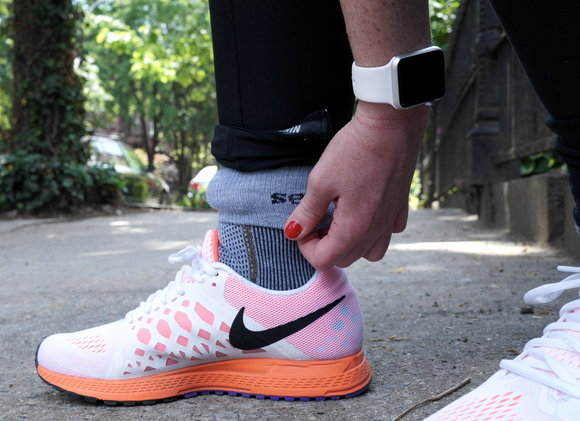 The app’s mid-run metrics are more useful in theory than in practice for a couple reasons: Most runners tuck their phones in an armband or pouch, where a heat map of their feet isn’t easily accessible, and staring at a screen while you run is so distracting that it will slow you down and defeat the purpose of using performance-enhancing tech accessories altogether. Trying to figure out how to turn off the metronome sound while on a run made for a truly frustrating experience. I was worried that the anklet would jostle around with the force of my feet hitting the pavement, but it stays securely attached to the sock. And it’s not at all uncomfortable to wear—you probably won’t even feel it around your ankle—but the material in the socks themselves is so warm that at the end of each 3-mile run, I couldn’t wait to rip them off my feet. I might actually wear these with my winter boots as I trudge through NYC’s epic snow piles, but I’ll put them in hibernation when the temperature rises above 60 degrees. I’m usually not a fan of the voice-coaching that running apps offer, because it’s distracting and not that useful. Sensoria’s coach, Mara, offers some helpful advice like reminders to land on your forefoot more, or to slow down when you’re getting ahead of yourself. But the voice-coaching section of the app has so many settings that it’s tough to tell what level of advice is useful and what veers into annoying territory. Even after four runs with this app, I still couldn’t strike the right balance. And the metronome sound designed to keep your cadence on point is like a mallet through the eardrum, especially when you’re trying to listen to music. There’s also something to be said for paying attention to your body’s cues, which are far more informative than any app’s metrics. If your technique is bad enough to cause you injury, you’ll feel it. If you’re a serious runner looking to quantify every aspect of your performance, you might want to add Sensoria’s smart socks to your line-up of high-tech gear. For everyone else, a quality fitness-tracking band and a great running app will do the trick. Sensoria's sensor-filled socks and Bluetooth anklet are designed to detect how you run and what you can do to fix your form. Helpful visualization of your feet as they land. Anklet is lightweight and comfortable to wear. Sock material can make your feet hot. Can only see data on one foot at a time, unless you buy two anklets. Voice coaching can be annoying.